To celebrate the 50th birthday of Destiny's CEO, we are offering 50% off our already discounted pricing for my Books, eBooks and Book Packs until April 30th 2019. Special Note: As we have limited stock of some books, those books will be withdrawn from sale once we have sold our remaining stock. If you would like to purchase any of our products then please use the 'Add to Cart' buttons to add the products to a PayPal shopping cart. You can then complete your order via Paypal by either logging into your PayPal account or by entering your credit card and delivery details. If you would like us to ship overseas, then please e-mail Shop@destiny.com.au and list the products you would like to purchase along with your delivery address and we'll reply with a quote. If you have any questions then please contact Destiny's Head Office by completing our Make an Enquiry form or by calling us on 02 4302 1800 if calling from within Australia or +61 2 4302 1800 if calling from outside Australia. Margaret's books 'How To Make Your Money Last As Long As You Do', 'How to Create an Income for Life' and 'How To Maximise Your Property Portfolio' are now out of print and we no longer have any stock of these books. Margaret's book 'How to Achieve Property Success' which was released on October 1st 2013 is a compilation of 'How To Make Your Money Last As Long As You Do', 'How to Create an Income for Life' and 'How To Maximise Your Property Portfolio' and includes new content as well as a complete revision and update of all of the existing content. 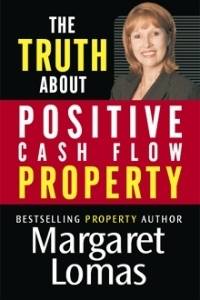 We currently have limited stock of Margaret's out of print books 'A Pocket Guide To Investing In Positive Cash Flow Property' and 'The Truth About Positive Cash Flow Property'. One of the first and most important things you should do when you become a property investor is learn to negotiate well. Investors are often all too prepared to spend $10,000 to $12,000 retaining a buyer's agent to negotiate for them on each property purchase, when spending a tiny fraction of that on educating yourself on how to improve your negotiation skills would be a far better idea. Margaret Lomas' book, 'How To Succeed In Property Negotiations' is a great place to start. Our Price: $9.95 including Postage and Handling within Australia. 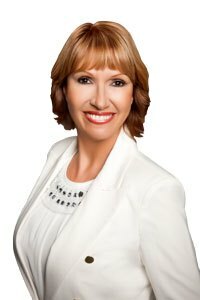 Margaret has been working with property investors for almost 20 years and has written several books encompassing all she has both learned and taught. In this new book, Margaret takes the very best from her first three best-selling books, published in the early 2000s. She updates the important information and revises and adds new current content. The result is a one-stop shop for property investors - the ultimate must-have for new and experienced property investors alike. Our Price: $37.45 including Postage and Handling within Australia. Please contact us to enquire about pricing for overseas deliveries. Investing in today's property market is different from investing pre-GFC. Old strategies are simply not working. So property expert Margaret Lomas set about comprehensively reconsidering the economy, property and the future of the Australian market. Slowly but surely she started to uncover ideas and information which no other property expert had really ever disseminated. She challenged all the accepted theories and started smashing the myths that investors had accepted for so long. "We are more than a decade into the 21st century and it's high time we began to think and invest like we live in this century, rather than the last!" says Margaret. - Recognising growth drivers to find the next hotspot before it becomes one! Our Price: $27.95 including Postage and Handling within Australia. 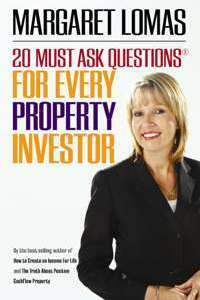 In '20 Must Ask Questions® For Every Property Investor' Margaret aims to make all investors so savvy that opportunistic spruikers have no market! This book is about the research phase of the property investment process, and aims to equip all investors with so much knowledge that they will be able to lessen the risk of making poor choices and feel comfortable about buying in any market. 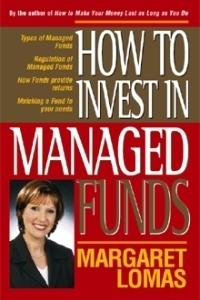 Unlike Margaret's other books, it does not cover financing or conveyancing, tax issues or any other peripheral steps. It is purely Margaret's 20 infamous research questions, in depth, so that you can be sure that your property research is comprehensive and all-encompassing. The aim of this book is to help to protect you against the many scams and dubious schemes which are so prolific today. In addition to uncovering the truth behind many of these, this book outlines the type of portfolio you do need in order to become financially secure, including examples of portfolios which every day people can build efficiently and without too much risk. The book looks in depth at many of those complicated structures which are often suggested today, and details lending structures and some tax information. A book for those who are already on their way. 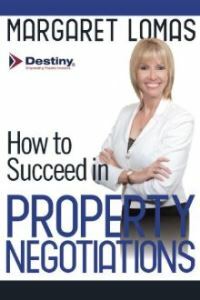 Once you have begun your journey, and have either commenced buying property or are ready to go, this book is for you. This book relies on you having read one of the other books in the 'How To' series and completely understanding the concepts of positive cash flow investing, as it does not contain much of the detailed knowledge which is crucial if you are to be successful as an investor. Actually, you would need an extremely large pocket to fit this book in - once Margaret started writing it, she just couldn't stop! The reference to 'pocket guide' is more about how to use it than it is about its size. 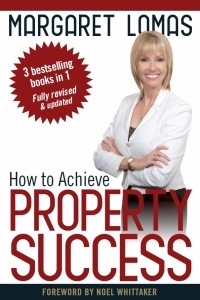 After having written the other three books (now combined into 'How To Achieve Property Success'), many readers told of how they were full of great information that they then needed to disseminate into a process they could follow. So, Margaret decided to do this for them. 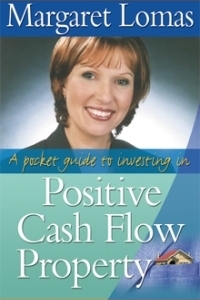 'A Pocket Guide To Investing In Positive Cash Flow Property' is not an educational book, as such. Rather, it is a process guide. It relies on the fact that you have already gained the knowledge from reading the other books and it gives you a step by step guide for the actual buying process. Each chapter is a new step and once you have read the entire book you will own a property. I use it myself every time I make a new purchase, just to make sure that I do not miss any steps. 'A Pocket Guide To Investing In Positive Cash Flow Property' contains formulas, calculators, things to photocopy for your bank and lawyer, and a checklist at the end of each step to make sure you have completed the step fully. Again, it will not teach you new information - it will simply organise the information you do have into a logical step by step plan. 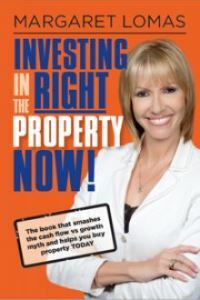 You will need to read one of the first two books (replaced by 'How To Achieve Property Success') before getting to 'A Pocket Guide To Investing In Positive Cash Flow Property'. From the author of 'How to Make Your Money Last as Long as You Do' (replaced by 'How To Achieve Property Success') comes a book that explores managed funds. Managed funds offer investors with relatively small sums of money the opportunity to access a range of investments across a spectrum of asset classes. In 'How To Invest In Managed Funds', Margaret explains the ins and outs of investing in managed funds in her trademark easy-to-understand style. We currently offer Margaret's self published books in PDF, EPUB and MOBI (Kindle) format. We are unable to offer Margaret's other books in a digital format. The publishers of those books have made most of them available as eBooks in Amazon Kindle, Apple iBook, Google Book and Kobo formats. Please visit the Amazon Kindle Store, Apple iTunes, Google Play or Kobo book store in order to purchase any of those books in digital format. Our Price: $7.95 including electronic delivery. Bundle and save by purchasing one of Margaret's book packs. 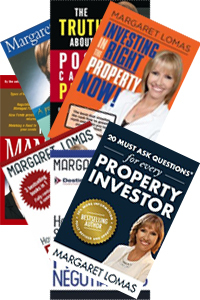 All of Margaret's book packs now include 'How to Achieve Property Success' and will continue to include 'A Pocket Guide To Investing In Positive Cash Flow Property' and 'The Truth About Positive Cash Flow Property' whilst we have stock of those books. 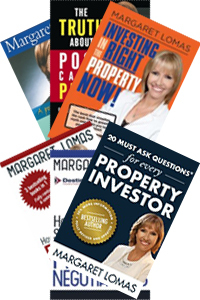 This is a bundle of 6 of Margaret's Property Investment books. - Investing In The Right Property Now! Our Price: $143.35 including Postage and Handling within Australia. This is a bundle of 6 of Margaret's Property Investment books along with her Managed Funds book. Our Price: $163.35 including Postage and Handling within Australia. Prior to 2017 for more than a decade Margaret toured Australia each year and presented Seminar's in capital cities and key regional areas in order to keep you updated on the latest property information. From 2009-2016 we made Margaret's Sydney Seminar available as a Webinar so that people who couldn't attend a Seminar in person could attend via the Internet. From 2017 Margaret has been presenting a dedicated Webinar each year which is live streamed to viewers via the Internt from her Studio. We offer recordings of the Webinars for purchase so that if you were unable to particiapte in a Webinar you can still keep up to date on the latest property information. This is a recording of Margaret's 2018 Webinar entitled "Investing in today's changed environment". With the lending landscape changing so fast, what does this mean for Property Investors? Margaret outlined what has happened and what is likely to happen and discussed with viewers useful strategies to manage this transition. Margaret also presented her yearly market update and released 14 areas that investors may find useful additions to their portfolio. The webinar recording includes the question and answer section which was held at the conclusion of the Margaret's presentation. Due to the duration of the webinar, the display resolution and the bit-rate of the recording, the webinar recording has file size of around 1.8GB. Please Note: These purchases are fulfilled manually. You will receive an e-mail the next business day after you have placed an order with a viewing link. Copyright Notice: A purchase of this product only entitles the purchaser to use the video for their personal viewing pleasure. You must not reproduce, transmit (including broadcast), distribute, publish, adapt, sell, modify or otherwise use any of the material contained therein, including audio and video excerpts, except as permitted by statute without prior written consent from Lomas Media. Our Price: $50.00 including electronic delivery. This is a recording of Margaret's 2017 Webinar entitled "Adjusting for the Disruption in Property Investing". The Sydney boom has brought delight for Sydney property owners and blow after blow for property investors Australia- wide. While the equity position of those lucky enough to hold a Sydney property may have finally improved, the government's response to this runaway market has thrown the baby out with the bathwater - with policy changes designed to halt this overheating market instead impacting markets everywhere, as well as hampering the future plans of many property investors. In this frank Webinar, Margaret looked at all of the challenges now facing property investors and provided a pathway that can be followed to ensure that your future plans do not suffer too much disruption. Margaret looked at the changing face of property investing, explained in full the policy decisions being made, and of course, provided her yearly batch of 'areas to watch'.